What Gives Leaves Their Fall Color? As the days get shorter and the nights get cooler, the leaves of our broad-leaf trees are losing their green, and entire forests are turning shades of gold and yellow, orange, red, and purple. This process is one of nature’s most beautiful spectacles, but the changes that create it occur within each tiny leaf cell, where pigment molecules are found. Three pigments are responsible for all the fall colors we see: the chlorophylls, light-trapping molecules that color leaves green; the xanthophylls, yellow pigments that help chlorophyll absorb light, and the anthocyanins, pigments that color leaves orange, red, or even purple. The green chlorophyll pigments are delicate and break down quickly. In the growing season, chlorophyll is constantly being made, so the leaves are green. But as the days get shorter, broad-leaf trees get ready to shed their leaves before entering winter dormancy and stop making chlorophyll. These delicate molecules degrade, and since they’re not replaced, the leaves lose their green color. The yellow xanthophylls are not quite as delicate, so when the green colors break down, the yellows become more conspicuous. Beech trees, like those in Bluebell Wood and in the Native Flora Garden, and willows, like those along the brook near the Monocot Border, have leaves rich in xanthophylls, so they turn bright or golden yellow. 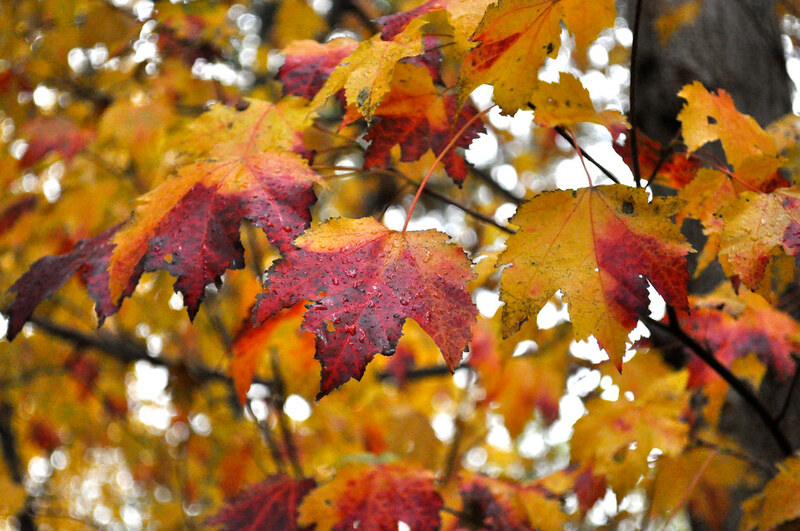 Sugar maple leaves also contain high levels of xanthophylls, so they also turn yellow before the anthocyanins start to dominate and their red emerges. Visit the Japanese Hill-and-Pond Garden or the northern end of the Native Flora Garden to see this metamorphosis in the sugar maples there. Anthocyanins develop in the leaf as the sugars build up in the cells. The leaf veins, which would normally carry the sugars away, get clogged with sugar. In the presence of light, the sugars react with proteins in the leaf to form the red pigments. 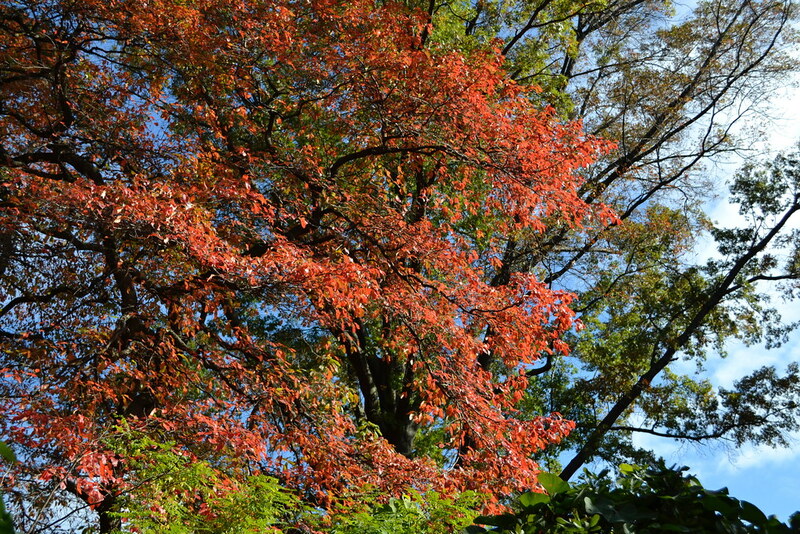 Sometimes the red pigments can develop even while the leaves are still green, as they do in tupelos and red maples, the first trees to develop fall color. Because they need light to form, the red pigments often develop in patches and patterns on the leaves where they are exposed to bright light. You can see this on the Callery pears planted as street trees all around Brooklyn. On the trees near streetlights, all the leaves facing the light will be red, even while the leaves on the other side of the tree are still green. The same thing happens to many apples as they ripen. As the sugars build up in the skin of the fruit, the side exposed to light turns red. 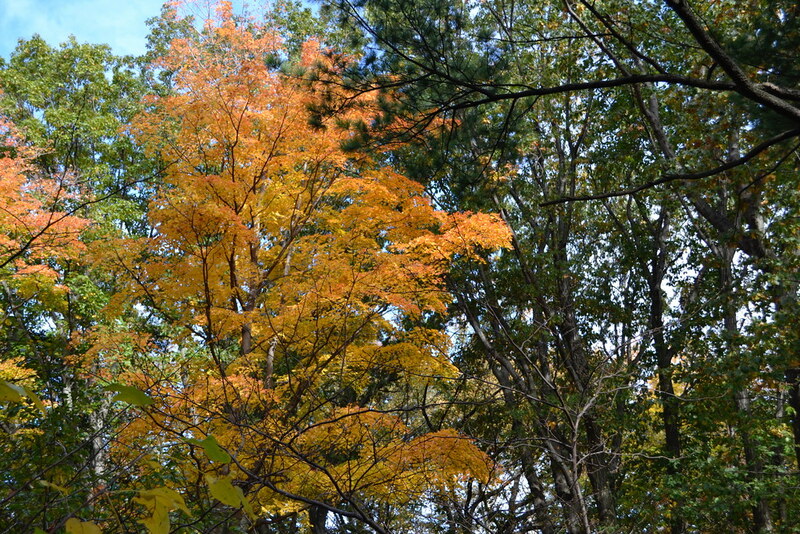 Cool nights and dry days help to intensify the colors. In cool weather, chlorophylls break down faster and the sugars in the leaf become more concentrated. A cold night can break down all the green pigments at once and change the leaves overnight. Dry days help concentrate the sugars even more. Each autumn is unique: Enjoy New York’s leaves in all their glory over the next couple of weeks. Kerry Barringer is a former curator of the Herbarium at BBG. He studies the plants of the Northeast, especially the mosses and liverworts, and makes detailed surveys of natural lands for state agencies and private conservation organizations. He works closely with the New Jersey Conservation Foundation and has done a complete survey of their ten-thousand-acre Franklin Parker Preserve in the heart of the New Jersey Pine Barrens. He is also an authority on the Dutchman's pipe family, Aristolochiaceae, in the New World, and the tropical species in the snapdragon family, Scrophulariaceae. Acer saccharum (sugar maple) in the Native Flora Garden. Photo by Blanca Begert. Nyssa sylvatica (black tupelo) in the Native Flora Garden. Photo by Blanca Begert. 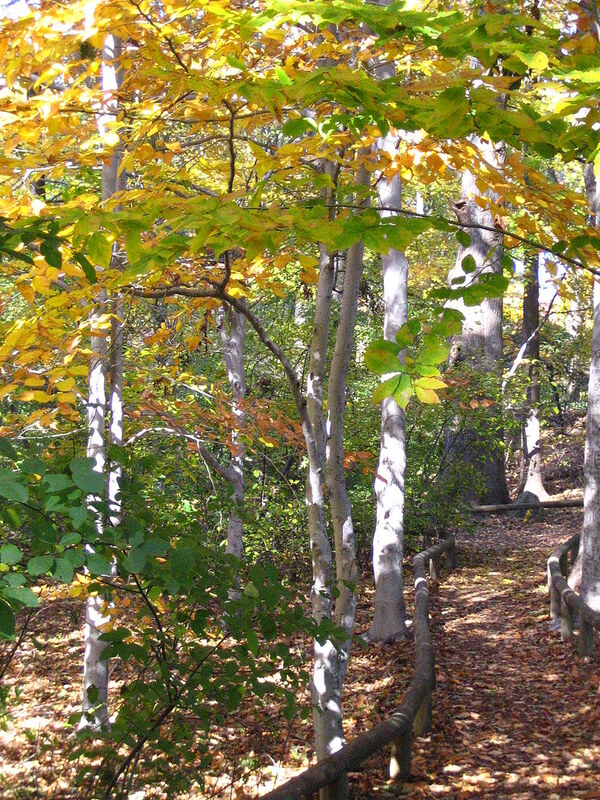 Beech trees in the Native Flora Garden. Photo by Uli Lorimer. Acer rubrum (red maple) leaves in the Native Flora Garden. Photo by Blanca Begert.